LIMERICK’S socio-economic renaissance is increasingly evident in bricks, mortar and industry tenancies in the city and suburbs. Two of five principal development projects under the auspices of Limerick City and County Council – Mungret Park and the Opera Centre – are progressing to An Bord Pleanála submission. Their construction alone promises a major employment boost for the hinterland with 3,000 workers involved in the Opera Centre development. The engine pulling these projects is Limerick Twenty Thirty Strategic Development DAC. Its chief executive is David Conway, a son of Limerick who returned to bed in foreign and indigenous investment in the city skycap. 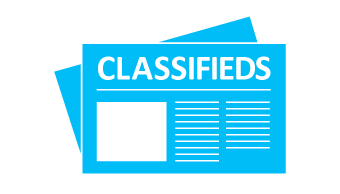 Tenant negotiations are ongoing across various sectors. He pilots Limerick 2030 from the former AIB branch in Patrick Street which itself will be demolished to facilitate the central Opera Centre Plaza. Contracted since April 2017, his accomplishments include the National Aquatic Centre, which attracted a one million footfall in its first year of completion, as well as being the primary agent in bringing through its house, the National Sports Campus. His current agenda includes Gardens International, Opera Plaza and the Cleeves Riverside Campus. His team is also working on the sprawling 60 acres of Mungret Park that are owned by Limerick Council. “Limerick 2030 was set up as the market had failed dramatically here,” is the first point this Dooradoyle local makes. “The company is unique in Ireland and even Europe. There are seven of us here and we keep the team very small, hiring out on a project basis,” he explained. 400 worked on the Nightfliers series at Troy Studios – set to double footprint. 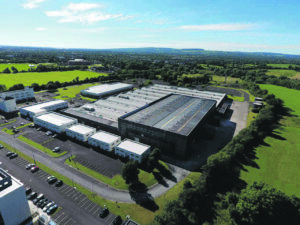 “We own Troy Studios and have a tenant out there, Seefill Ltd trading as Troy Studios, delivering fantastic employment opportunities for this region and supporting opportunities for a knowledge based industry and a film based industry. 400 were employed while ‘Nightflyers’ was being shot here. Last year the studios announced plans to double its footprint; Ireland’s film tax credits are the international incentive to this investment. Opera Site, Patrick Street /Michael Street. 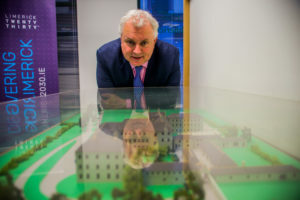 “The planning application will be lodged shortly, in a matter of weeks.” After signing off on the 150 drawings and 19 chapters that form the planning submission, he hopes that this marks the beginning of the long-promised redevelopment of the prime city centre site. “If passed, it will be a new living room for Limerick – the library team came up with that idea and they want ownership of the project. There were three weeks of public consultation back in April 2017 – clearly looking to obviate the objections that stymied schemes over the years. Now working with a brief “to relate to the heart of the city,” there will be funky stuff such as an aparthotel, bijou retail and cafés, even a mirror pool for ice skating, hosting markets and useful as a band/ festival platform. The Cahill May Roberts monolith will be knocked and a 14 storey tower goes up. Overall some 16 per cent of this contemporary village within vintage corners will be residential, not including the hotel where his offices are. “We have been asked to create a master plan for the 60 acres owned by Council. There was public consultation in June and we go back out to the people and tell them what the report says. Cleeves, Fernbank: See video enclosed for his vision for this “multi-service, multi-use” mystery campus speared by that towering brick chimney. BALLYKEEFFE born and reared, David Conway witnessed the brick by brick development of 1973’s Crescent Shopping Centre from his front garden. This is the consumer mass that flourished to become the Mid-West’s largest and most successful shopping/ leisure campus. Expansion is ongoing annually. He looks back with immense fondness on his days as a Garryowen Senior Goliath. He’s still a big fella. Graduating in PE from Thomond College, he went on to work with the IRFU and came back to UL in Sports administration when the UL Arena was coming up. Leading in on the major sports complexes in Dublin was satisfying. married family life in County Meath at weekends. What he loves about Limerick? “I will miss not going to Thomond Park on Saturday.” [Munster just about took the Exeter Chiefs on January 19]. What do you want for Limerick?